B.C. 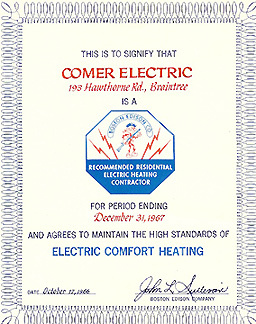 Electric was established in 1964 by William M. Comer, Sr.; Bill ran the business from the basement of his home in Braintree, Massachusetts. He was forced to work from the basement because his nine children took over the rest of the house. His first award is addressed with the Braintree home address as this is where B.C. 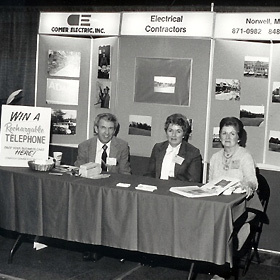 Electric, formally known as Comer Electric, Inc., was founded. B.C. Electric was established with a strong sense of family as it's foundation. B.C. Electric has emerged from a primarily residential business to commercial projects by sticking to the plan, hard work and satisfying every customer. Bill believes that there was never an end to the day, week, month, or year; all time blended together to build a successful electrical contracting firm now located in Norwell, Massachusetts. The projects over the years have been many throughout New England and as we have grown, the rest of the country. After 45 years, our website has chosen to focus on the recent although our team has been working diligently and expertly since 1964. We have formed many successful and long-term relationships over the past 45 years with our professional in-house and field team, vendors, and General Contractors. Our team has always believed in satisfying the customer and our daily performance has always been based on good faith and high standards. unbeatable work ethic. I have spent the past 45 years building solid relationships, securing an excellent reputation for successfully completing projects from start to the very last detail, and developing a highly motivated team of dedicated employees. Please feel free to contact me through the office by reaching my daughter, Joan Comer, who now runs the operation while I am enjoying semi-retirement.